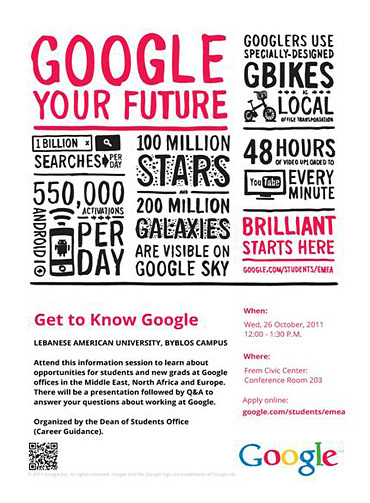 Attend this information session to learn about opportunities for students and new graduates at Google offices in the Middle East, North Africa and Europe. The presentation by speakers Matt Mitro from Google UK and Souheil Soueid of Google MENA will be followed by a Q&A session to answer your questions about working at Google. LAU students and Alumni are welcome to attend. To sign up for the presentation, please contact Career Guidance Officer in Byblos, Ms. Rana Sakr, at ext. 2350 before Octover 24 and provide your name, LAU ID number, major and phone number.